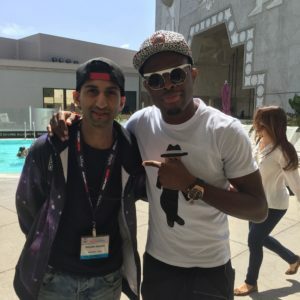 ASCAP – Meeting with OMI with his hit song “Cheerleader” and more writing in LA – Sheldon Universe Inc.
Ascap was the american perspective on the music industry. I was able to meet and setup collaborations for the future. I encountered a long list of hit writers and producers including: Brett James, Kevin Kadish, LaShawn Daniels, Priscilla Renea, James Fauntleroy and 1500 or Nothin’, Omar Pasley (OMI), Timbaland, Harmony Samuels, and many more musicians in the game. If you are ever in LA go to a place called ‘Dirty Laundry’ for Super Soul Mondays featuring JJ and the Spectacular where you will hear a live 10 piece band in a speakeasy atmosphere. It has been known to host the greatest musicians in the scene. Even John Mayer decided to drop by and jam one Monday.